Streaming radio listeners have words of caution to music services, including Radio, that have designs on converting them from FREE to PAID SUBSCRIBER: “Not so fast.” Kelly Music Research surveyed 500 people aged 17 to 59 years old in large, medium and small markets nationwide about their behavior and preference for streaming music services. We asked about some of the big streaming players who offer FREE and PAID services. We also included AM/FM radio in the array of topics. Not only did most say “no thanks” to the idea of paying for their current free streams, verbatim comments show that many were infuriated by the hypothetical scenario suggesting that AM/FM Radio might one day ask for a subscription fee. Fewer than 8% of our survey respondents reported using the PAID versions of Pandora, Spotify or SoundCloud. Advertiser supported FREE is still preferred among those who have embraced streaming. Pandora leads the pack among streamers with 64% saying they have used some form of the service. 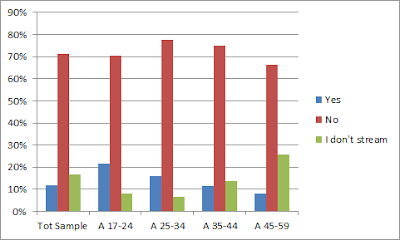 The number jumps to 75% of the younger 17-34 demographic. Spotify was the service more likely to earn paid users with 4.6%, followed by Pandora’s paid version with 2.4%. 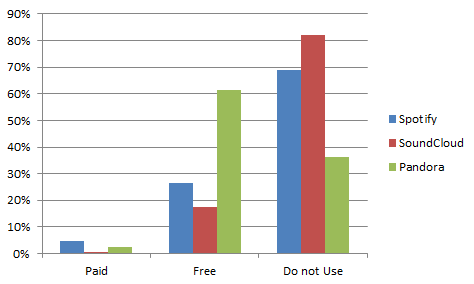 If FREE were no longer an option, few said they would ante up. Assuming there are other services out there that remain free, the vast majority would rather switch than pay. Only 12% say they would pay for their favorite stream if it were no longer free. Men are more likely to pay (14.2%) than women (10.5%). Younger streamers are the most willing to pay - 22% of 17-24, 16% of 25-34, 11% of 35-44 and 8% of 45-59. The remainder would refuse to pay and just find a free service. They are still listening to AM/FM. 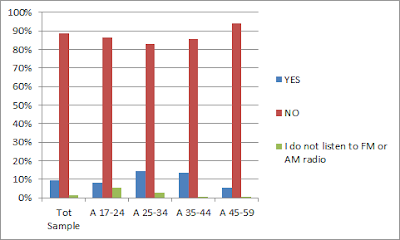 Interestingly, only 1.6% of our sample says they never listen to AM/FM. However, significant numbers now only listen to Radio while in the car. 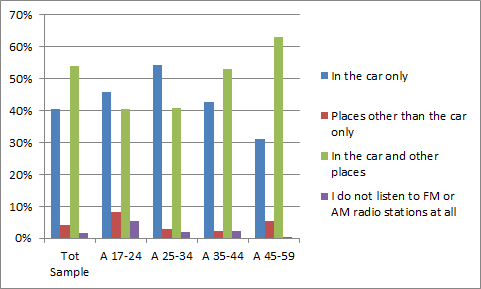 While 98% report they still listen to traditional radio, 40.4% say the only place they listen to AM or FM radio stations is in the car. Among the younger 17-34 year olds, about 50% tune in to AM/FM only in the car. Would you pay for AM/FM? Similar to our question about being forced to pay for their favorite free streaming service, we also proposed the notion of being forced to pay to listen to AM/FM radio. Only 9.7% said they would pay to listen to their favorite AM/FM station. Compare this to 12% who say they’d pay for their favorite stream choice. Often the most interesting reading in surveys is responses to open-ended comments. These comments are optional, so not everyone adds a comment. Typically, those who are most moved by the subject or are passionate about an issue feel compelled to say something extra. It’s important to remember each comment is only one person’s opinion. As you read through the comments, you will see themes surface. It is these common threads that can lead to real answers, assumptions, or more questions. Optional additional comments re: PAID vs FREE audio streaming. Gender, Age and home State listed. I will never pay to listen to music. I also like the DJ's. Why put them out of jobs? I don't think there is a paid radio station. All the channels I listen to are free of charge. Music has been the main source of entertainment way before television. With everything costing money music needs to remain free. Music does so many things. It lulls babies to sleep, makes people cheer up, allows people to put their feelings into songs, and makes special moments even better by hearing a special song that makes your heart race and make you smile. Keeping it free makes it available for everyone. I will only pay for music if I want an entire CD. On-line and radio should be free! If music streaming services that were originally free was paid, then I'd most likely stop using streaming services. I pay for Sirus radio because the FM stations where I live have too much crap on them & very little music -- and the music is always the same!! Never anything different -- I know there is a ton of music made & all I hear on the radio is repeated music over & over!! I think Most Music should be free. They took tv away now the radio? Cmon. If i was going to pay for music, i would probably just buy songs/albums from itunes. I pay for Tidal because it has exclusive access to my favorite artist's catalogue, which is not available on any other service. Free is better because the service can always sell ad space for income. I currently ony listen to FREE music services. I will never subscribe to PAID music services. I definitely believe the artists should get their fair share of the profits from these services, especially when they're just getting started. Bands need the resources to not only live on, but so they can evolve and grow. I support my favorite artists by buying music, merchandise, concert tickets...but I would absolutely never pay to listen to favorite songs on a per-listen basis. At one time I was willing to pay for music services & did so for about a year & found it to be a waste. I had an additional 50+ stations & still often found nothing I wanted to listen to. I pay for streaming because i need it for my job. I woulf pay for spotify however 9.99 per month is expensive in my opinion. Paying for music should be limited to buying it. If I had to pay for music services, I would just buy the music and play it on my own MP3 player or CD player rather than pay a monthly subscription. Music subscriptions are not worth it in my opinion. By the time you pay for a month's subscription fee, you could have added an album to your personal collection. Support the artists BUY the music, not rent it. I would more likely listen to a free music services because then if the song is good I'll decide if I want to buy the song or not because of how much I like it. ive never paid for radio. Stations should raise revenue the old fashioned way - earn from advertisers and/or sponsors! If the artists got more than a mere pittance, I would be more likely to pay for services such as these, however, knowing what artists get -- especially younger or less popular artists -- I'd rather purchase their music outright and use Clementine or MusicBee for my player. Free Services like Spotify would benefit from allowing the same functionality of the paid service but commercials/ad should be required listening to use this functionality. Its not worth it to have to pay to listen to music. I have CDs I can listen to over and over again. it makes sense that streaming services are starting to charge, i like that i can take spotify anywhere and i don't have to deal with commericals. if the radio was no longer free, they would lose a lot. no one wants to pay for FM/AM radio, thats what satelite radio is for. If FM started charging I would go to sirius xm. Genreally music should be free. If you want a particular song or album for your own collection, you should purchase that. I think that paid services would need to offer more background services to outweigh free services. Free music services are the best. If things were required to be paid in order to listen I feel as though they would lose a lot of business. I don't see a need to pay for music services. I would rather listen to commercials than pay for service. If I had to pay to listen to music, I might as well just buy CDs and listen to them. That way it's only a one time fee. I used to have XM and later XM/Sirius Satellite Radio. A few years later I discontinued the service. I would rather listen to a service that has minimal advertising. I don't think that we should be charged to hear music. Radio should always be free. The only thing I pay for money is ITUNES and thats it. As far as radio is concerned, there are already cable versions to pay for and there should be plenty of free options. I believe in equity and deleting a free option for radio stations doesn't serve those who do not make enough money to pay for the extra luxury of a paid only music service. I enjoy saterlite radio and pay a fee however I wish that they were free as well. I listen to radio and streaming service to hear new music and I don't mind advertising (I don't love commercials, but I think it's a fair trade). When I hear new artists and albums that I like I buy CDs and/or vinyl. The commercials that they play pays for the music. I shouldn't have to pay on top of that. Well first of all, it depends on the total monthly cost and what benefits I would receive by purchasing this service. It's not as simple as saying I will only use a free service. I pay for XM radio. I would not pay for FM or another streaming music service. I do listen to Amazon Prime so it's paid but I was already paying when they added streaming music. I listen to commercials to help keep my radio station free to me. I hope that doesn't change. free is better! but i love my radio stations on air. I think AM & FM radio should remain free. I would not like it, but I suppose I would pay for radio (I would expect to have a selection of AM/FM stations for the price). I pay for television service, I would not pay for radio service. Not enough of my favorite content. I don't mind commercials, that is how I get to listen to music for "free". I would just pay on itunes and have the songs for life. I enjoy my Sirius subscription. I don't have it in my car, however. I wish regular radio would offer more choices. Free radio still is important. If I'm already paying a fee for my internet access and with music streaming I have to pay more (due to BW usage), I would not like paying for streaming music. I like having a free service to introduce me to new music. There is so much new music out there that is not good, I would not be happy to have to pay to hear it. The only paid music service I use is Amazon music because it is included with my Amazon Prime subscription. For under $100 per year, not only do I get music, but I get movies, free 2-day shipping and other benefits. Why will i pay to listen my FAVORITE FM or AM RADIO STATION in the Car? Summer time is travel time for many radio listeners. In those weeks between Memorial Day and Labor Day, markets can see huge swings in population change. Some radio markets empty out while others in destination locations fill up. Do you wonder about your listeners and station listening fluctuations in the summer? What do travelers listen to while away from the homestead? 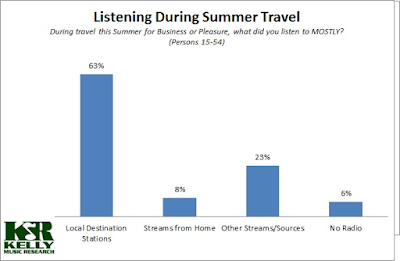 Kelly Music Research conducted a national study of over 500 people aged 15 to 54 and asked them about summer travel, radio station listening preferences, and actual listening while on their 2015 Summer road trips. 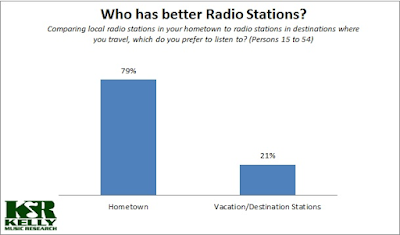 Overall, comparing local radio stations back home to the radio stations in destinations where they travel, 79% say they prefer their hometown stations over those they find in business or vacation travels. As Kelly Music Research sees in local market music surveys across the country, music tastes can vary widely from market to market - even within formats. For example, artists like Ted Nugent, Lynyrd Skynyrd, Billy Joel, Metallica and Journey can each be Classic Rock listener favorites in some markets but not others. So it’s not surprising that well-programmed local stations do a better job pleasing the regular hometown folks than out-of-town stations. But when they travel, radio listeners indulge themselves in local offerings. Even in this age of technology where users can stream their favorite hometown station anywhere in the world, many choose to enjoy the local market flavor, and that includes the local radio stations. 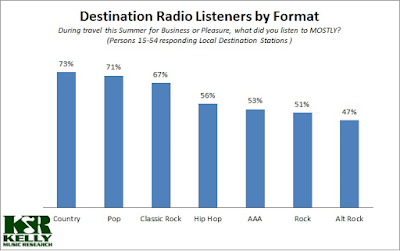 63% of those who traveled this summer tell us they did MOST of their listening to the radio stations in their destination towns. Only 8% of travelers said they preferred streaming their hometown stations while away. 23% reported streaming audio services such as Pandora or Spotify on the road. 6% of travelers report not listening to radio or streams at all, opting for iPods, CD’s or nothing at all. Unfortunately for radio stations in popular destination towns, travelers are not included in ratings. 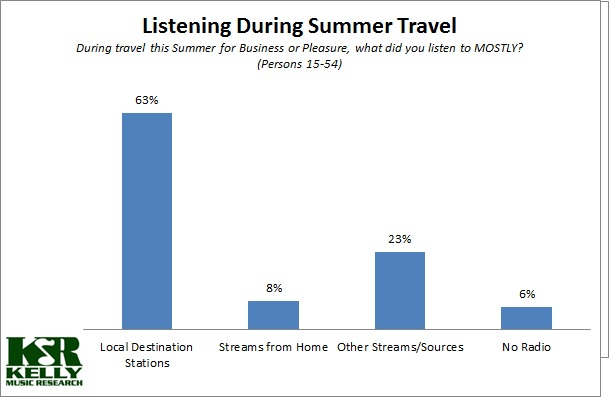 Based on our findings, if vacationers were included in listening surveys, stations in destination towns would likely see a noticeable spike in the Summer months. 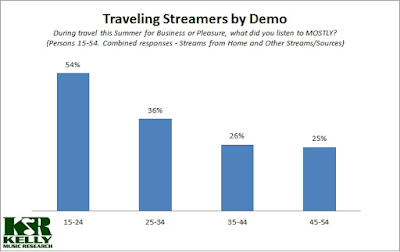 Younger listeners are more likely to stream while away. 50% of 15-24 respondents prefer streaming with 11% streaming their hometown stations and 39% streaming some other source. In terms of Format Preference Groups, Alternative Rock listeners were most likely to stream (54%). Country listeners were most content to listen to the local radio stations when travelling. 73% of Country partisans say they listen mostly to their destination stations and only 3% stream their hometown stations while on the road. Even though travelers clearly prefer their hometown stations, more than half report enjoying the destination stations during their getaway. 58% of travelers give destination stations positive marks with 16% saying they Love the local stations where they travel. An additional 30% say the local stations are at least Okay and only 7% say they Dislike stations at their destinations.